Students can earn an online PhD in engineering in specializations that range from the philosophy of systems and engineering management to aeronautics engineering. The term “engineering” applies to mathematical, scientific, social and practical knowledge as it is used to innovate and improve upon existing machines, tools, computers, systems and processes, resulting in many specializations that PhD candidates can pursue in online programs. Discover some of the academic and career opportunities that await engineering students pursuing online doctoral degrees below. To help refine the search for an engineering doctoral program, prospective students can compare current online PhD degree programs by sorting factors like tuition cost, graduation rates and student-to-teacher ratios using this ranking data chart. The University of Southern California Viterbi offers a variety of engineering PhD programs. Graduate students may pursue a PhD in concentrations that include biomedical engineering, astronautical engineering or electrical engineering. PhD students are required to maintain an average GPA of 3.0 and complete 60 credits to earn a degree. The learning management system Blackboard is utilized by USC Viterbi; graduate students may submit necessary assignments and communicate with professors through Blackboard. A variety of different on-campus housing options are available to graduate students at USC Viterbi. Graduate fellowships and FAFSA financial aid are offered to eligible students. The University of Tennessee-Knoxville's College of Engineering today encompasses eight departments of study across seven nationally accredited research centers. In 2015, the College of Engineering conferred 85 doctoral degrees. PhD programs are offered in the fields of Aerospace Engineering, Biomedical Engineering, Biosystems Engineering, Chemical Engineering, Civil Engineering, Computer Engineering, Computer Science, Electrical Engineering, Energy Science & Engineering, Engineering Science, Industrial Engineering, Materials Science & Engineering, Mechanical Engineering, and Nuclear Engineering. Recently the UT Engineering department celebrated 178 years of research and scholarship. Its newest facility, the Min H. Kao Electrical Engineering and Computer Science Building, was dedicated in 2014. Columbia University in the City of New York was founded as King’s College 1754. Today, the Fu Foundation School of Engineering and Applied Science puts graduate students in direct contact with some of the city’s noted established or emerging technical/business communities. More than 3,100 students are enrolled in the school’s graduate degree programs. Seven schools within the Fu Foundation School of Engineering and Applied Science offer doctoral programs in disciplines including Applied Physics and Applied Mathematics, Biomedical Engineering, Chemical Engineering, Civil Engineering and Engineering Mechanics, Computer Science, Earth and Environmental Engineering, Electrical Engineering, Industrial Engineering and Operations Research, Mechanical Engineering, Computer Engineering, and Materials Science. Engineering courses have been part of Texas A & M University-College Station since its founding in 1976. The largest college on today’s campus is the College of Engineering, supporting more than 18,000 students. Its PhD degrees are offered in 20 unique engineering fields, including computer engineering, biomedical, civil engineering, computer science, electrical, industrial, mechanical, and petroleum engineering. The Texas A&M University College of Engineering is currently waiving application fees for students from “specific target institutions.” Contact the college for details. The college is home to more than 40 different engineering organizations for students. From its home in Happy Valley, the Pennsylvania State University-Main Campus supports a large range of advanced degree programs in engineering. The College of Engineering created the Engineering Energy & Environmental Institute (E3I) in 1999. In addition to degree programs, the college operates the Engineering Energy and Environmental Institute, Facilities Engineering Institute, Institute for Natural Gas Research, and the Larson Pennsylvania Transportation Institute. Some 13 distinct College of Engineering departments and doctoral degree programs are offered at the University Park campus. The Petroleum and Natural Gas Engineering program is offered at the Commonwealth Colleges and University Park. The College of Science and Engineering at the University of Minnesota-Twin Cities currently enjoys more than 570,000 square feet dedicated to scientific research. More than 75 student groups support engineering students at the college. Doctoral students can choose from more than 17 fields within the engineering discipline and take most of their courses through the UNITE online class management system. Corporate partners of the engineering programs include the American Chemical Society, Cisco Systems, Inc., ExxonMobil Corporation, Facebook, Google, IBM, Dow Chemical, Seagate Technology, Honeywell Aerospace, Proctor and Gamble, and the Intel Corporation. In 1949, the University of Alabama established an extension center in Huntsville. From humble beginnings on a middle-school campus, the university has expanded to today’s eight Huntsville colleges serving more than 8,400 students. Renowned engineering scientist Dr. Wernher von Braun assisted in the creation of a research institute that opened in 1969. Graduate engineering departments at the university offer PhD degrees to more than 140 students in fields that include Chemical Engineering, Civil Engineering, Electrical and Computer Engineering, Optical Science, Engineering Management, Aerospace Systems Engineering, Industrial Engineering and Quality. This large, state university considers itself “The People’s University” for the emphasis it puts on helping individual students excel. More than 175 programs are offered at the baccalaureate, master’s and doctorate levels. The James Worth Bagley College of Engineering has been a leader in education and research for more than 100 years. Ten degrees are available at the master’s level, such as aerospace, biological and civil engineering. Each of these programs offers specializations in a variety of areas. Master’s students are involved in a range of research, often conducted in partnership with industry leaders in their area of specialization. More than 90 years ago, Southern Methodist University established the Lyle School of Engineering at its Dallas campus. The Lyle school began offering distance education in 1967 and today students from around the globe take graduate courses entirely online. Graduate degree programs through Lyle include specializations in civil and environmental engineering, computer science, electrical engineering, engineering management, information, and systems, and mechanical engineering. Hybrid courses are comprised of online and campus-based Monday evening components. PhD programs are offered in civil and environmental engineering, computer science, electrical engineering, operations research, and mechanical engineering. Comparing online engineering PhD programs side by side can help a student determine which PhD programs they want to apply to. Factors such as cost, type of school and student population can all affect a student's decision. Use the search tool below to sort programs according to a variety of important factors. Online PhD programs in engineering often offer a variety of specializations, and while some programs can be completed in three years, others can take up to six. Regardless of the timeline, the work students put into these PhD programs is usually intensely focused and in-depth. It can be important for students to consider how much time they want to commit to earning an online PhD when choosing an engineering program. See an example of what to expect during the application process and a sample four-year track timeline below. Because online engineering PhD programs typically cover a wide range of course material, students should investigate particular areas of interest and faculty members they want to work with when deciding where to apply. They may need to demonstrate both their interest and their previous knowledge to be admitted into an online PhD in engineering program. Applicants are often required to have a bachelor’s degree, preferably in engineering or a related area, through an accredited institution. Programs may ask to see official transcripts from all higher learning institutions that an applicant attended and may have minimum GPA requirements. Applicants interested in pursuing a PhD in a hands-on engineering field like mechanical or hardware engineering may need to provide proof that they have experience in their field. Previous experience is usually submitted in a résumé, but may be required in a larger essay or in a program’s application. Online engineering programs may ask an applicant to write a statement of purpose that addresses why a student chose a particular program and elaborates on their ability to do advanced research; demonstrates their knowledge, passion, experience and skill; and notes an intended area of study. In addition to a résumé and a statement of purpose, programs may ask for a personal statement which may explore an applicant’s history and life experience and address what an applicant would like to get out of pursing an online PhD in engineering. Individual programs may require applicants to demonstrate minimum scores in the math and verbal areas of the GRE from exams taken within a certain number of years. Students may enter online PhD programs with a clear idea of which engineering department they will work in. However, the first year in an online PhD in engineering program is generally spent learning about each possible area of study and often serves to deepen research skills and technical experience. Online engineering doctoral degree programs typically have a core series of classes that introduce students to basic engineering concepts like modeling technologies, common systems management principles and the economics of engineering. Though students in online PhD programs often do not learn in on-site labs, some programs offer facilities via satellite for distance learning students. Students interested in practical aspects of engineering, such as mechanical or computer engineering, may need to find places to gain tangible experience. Students generally will need to decide to pursue a narrowed course of engineering study by the end of their first year. Common specializations may include the theories and ethics of engineering; management and engineering; or civil, mechanical or computer engineering. Students may spend a lot of time investigating their chosen field before finding an area that suits them. Some online PhD in engineering programs allow as many as six years before a student must propose a dissertation topic, and students can often spend that time building up their experiences and knowledge before completing their degree. Students who may not have begun their engineering program knowing exactly what they wanted to study will usually narrow their focus in their second year, choosing specific aspects of their chosen engineering specialization to explore more in-depth. Throughout an online engineering PhD program, students will typically design projects and conduct research within their fields, refine their approaches and execution techniques, and accept feedback from advanced faculty. Students may choose online engineering doctoral programs based on possible areas of specialization and the faculty who work in these areas. As they work toward an original project for their dissertation, students may need to select an engineering faculty advisor in their field and begin discussions about this final academic work. A qualifying examination is usually delivered by engineering faculty members familiar with a student’s chosen field of study. It may include an oral component in addition to a written test. The exam is meant to determine each student’s ability to apply general concepts and methods in their chosen field. Students may also have to complete a research proposal exam before beginning work on their engineering dissertation. The final year of an online PhD in engineering student’s degree is often spent working on their dissertation. All core class requirements and electives are usually completed by this time, allowing students time to focus on this final project. Dissertations will likely address an aspect of engineering that could be improved upon or altered in some way. This project is generally an example of how a student will contribute to their engineering field. Online PhD in engineering programs may ask for certain scheduling applications or dissertation draft submissions before a student attempts to earn their engineering degree. These application and submission deadlines may be as many as three months out. Online engineering PhD students who have completed all of their coursework to their instructors’ satisfaction will often be well-prepared to deliver their final dissertation and defend their expertise to a panel of fellow experts. Tests throughout online doctoral engineering programs may help to ensure that any student who makes it to this stage is academically committed to expanding knowledge in their chosen field. An engineering dissertation often needs to follow professional formatting guidelines. Students should be sure if they are working with sensitive or confidential information not to include those aspects in their dissertation as these documents are often considered public. An oral exam often requires a student to justify the methods and conclusions of their dissertation and to explain how their work relates and contributes to the existing body of knowledge in their engineering specialty. Students generally enter online engineering PhD programs with basic knowledge in their area of specialty. These advanced academic programs often teach students how to research and explore current knowledge on an even deeper level. 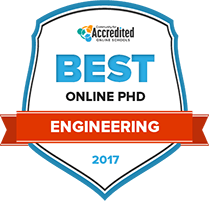 Online engineering PhD program graduates typically teach students general concepts and methods, and while students learn how to practice these techniques, they may also develop the ability to apply these principles to their own specialized areas and any other areas of their field they may encounter. Engineering is a field that is often adapting and changing with new technologies. As this field advances, PhD program graduates typically have the research abilities and connections within both professional and academic fields to keep up with these changes. Online engineering doctoral graduates may seek out the highly specialized jobs that fall within their refined scope of learning. They may also choose to use the broader researching and knowledge-application skills they usually learn in PhD programs to find work in other elite fields. A PhD student may head back into the classroom as an Engineering Professor after graduation, teaching general and specialization coursework on everything from basic engineering principles to physical laws, mechanical development, instrumentation, process and services. Specializations may include chemical, civil, electrical, mechanical, mineral or petroleum engineering. Educators will typically have the time and resources to double as researchers in their selected field. Technology professionals typically need to be prepared to continually evolve, adapt and improve existing tech. Computer hardware engineers often keep themselves current on computer engineering trends and new technology as they design, develop and test computer components. They also may ensure that computer pieces like processors and routers work together as systems and may work to advance computer technology. The federal government employs the highest amount of computer and information research scientists, but professionals in this field may work for businesses, in medicine, in science, or in other fields. They are often in charge of coming up with creative uses for current computing technology and inventing, designing and creating new approaches to computing as well. Computer and information systems managers are often also called IT managers or IT project managers. They typically plan, coordinate and direct all computer-related activities in an organization or business. Professionals in this field may help individual companies achieve their information technology goals by implementing the appropriate computer systems. They may also be required to manage their resources as well as their employees. This membership organization promotes engineering and technology education and works to improve existing programs. This international organization seeks to increase women’s impact in all aspects of technology, improve the impact of technology on people’s lives, and help communities, industries, education programs and governments. These combined associations have established IT standards for the industry and provide members with benefits ranging from legal aid to advertising. This international scientific and educational organization works to advance the information technology industry and provides publications and career resources to its members. Several current engineering professionals employed in various areas of engineering and business give their insights in this semi-formal podcast that offers insight into the many aspects of engineering. This professional organization of technology professionals provides publications, technology standards, and conferences to its members.